Saw the New Year in in Nerja. Enjoyed the firework display at the Balcon de Europa, awonderful way to start the year. Villa Tetuan is really excellent, warm sunshine outside, a great woodburner for the evenings. 9ould like to thank you for our holiday. you have a beautiful villa. Perfect for us. We all enjoyed ourselves. Will certainly recommend you to our friends. We had a fantastic time. A lovely garden to relax in. Thank you we look forward to returning soon. We enjoyed your villa, is great for us. Bars beaches nd restaurants all very good. A wonderful week. A real home form home. We had a lovely stay in Villa Tetuan. Thanks for everything. We had a great time, hope to return. Enjoyed Christmas here in Nerja. The villa is comfortable, the wood burning stove is grerat in the evening. We enjoyed our stay, hope to return in the summer. We love Villa Tetuan, really enjoyed the terrace and garden. We had lots of warm sunny days to lie on the sunbeds. We had a lovely stay in Villa Tetuan. Looking forward to our next visit. Had a lovely stay.Many thanks. We had a fab holiday again. Thank you for your help. The accommodation is excellent. We will be sure to look you up next time we stay in Nerja. We had a great time and were really pleased with the accommodation. Had a fabulous time in the villa. Thank you very much for your efficiency throughout all our dealings. We had another lovely holiday at Tetuan. we particularly enjoyed sitting in the garden in the evening. We would certainly go back to Villa Tetuan on the lovely complex. We had a wonderful holiday - you have a lovely villa. Our third time in Nerja. I cannot describe how pleased we were with the villa it was by far the best accommodation we have ever had whilst on holiday, in short it was perfect. I am hoping to return later this year. What a lovely week we spent here, the villa is lovely with everything anyone could need. Once again enjoyed Christmas is the sun, fabulous weather. Always a pleasure to return to Villa Casablanca. Another wonderful extended stay despite the unusual amount of rain. As always the villa was clean and wonderfully presented. It really felt like coming home. Already looking forward to our next visit. Great family villa. Both large terraces gave the children plenty of space and freedom. The Oasis is so nice we were happy to let the family wander off ahead of us to the pool. We had a great time. Loved Villa Casablanca. The open views are great. Liked the easy walk to the beach. Found the large terrace very private and peaceful. Hope to return next year. A fantastic holiday. We would certainly book with you again. Once again a lovely holiday in your villa. A really lovely villa. We had fab holiday. A wonderful holiday. The villa and location are superb. We would just like to say we have enjoyed our stay in your villa very much and would book again in the future when we return to Nerja. We found the Villa to be excellent. 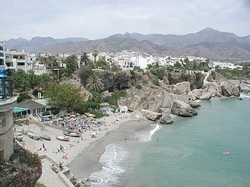 Nerja Town and the Oasis are both fabulous locations. We would like to thank you for the assistance you provided with the taxi etc. They were very reliable and really helpful. Thank you once again and look forward to contacting you again in the future. We had a lovely time. You get a lovely view out to sea and the roof top terrace. It was well equipped and we liked the sun beds. The new Mercadona came in handy. I'm sure we would like to return. Thanks again for providing us with a lovely property to build even more memories of wonderful Nerja. Had a great week in your lovely villa. Casablanca it was a wonderful week and the villa was fab! enjoyable time, Nerja is so gorgeous. I would like to say Villa Casablanca was a lovely apartment, well equipped with everything we needed for a great holiday, i will recommended it to our family and work colleagues. We really enjoyed the villa, especially the superb terrace. It was our first visit to Nerja and we were impressed with the Oasis and the town. The main condition of acceptance of any booking is that good care is taken of the property and its contents, and it is left clean and tidy. This care is to include all utensils, crockery, equipment, linen etc. HOLIDAYS usually start on SATURDAY from 4.00pm. To allow the cleaning company time to prepare the villa for the next clients the property must be vacated by 10am on the day of departure. A non refundable DEPOSIT of 25% is payable on booking and the balance due 8 weeks prior to start of holiday. Failure to pay may result in the holiday being re-offered for sale. Flight details are required for your inbound and outbound fligths in order to issue keys. FOLLOWING receipt of booking form you will be sent confirmation of the booking and you are then responsible for the balance of the rental. THE PROPERTY is offered on the understanding that no more than the MAXIMUM NUMBER OF PEOPLE indicated on the booking form shall use it. MAXIMUM 4 PERSONS PER PROPERTY. IT IS THE CLIENTS RESPONSIBILITY to exercise due caution whilst in and around pools and terrace areas as the owners ACCEPT NO RESPONSIBILITY. IT IS STRONGLY RECOMENDED that all members of the party are adequately insured. NO LIABILITY is accepted for any loss or damage, sickness or injury howsoever caused which may be sustained during the holiday to the TENANT or any member of the party as defined above. EQUIPMENT- The property is equipped with sufficient crockery, cutlery, kitchen equipment, dining and easy chairs, beds and bedding for the standard number of people as indicated. BREAKAGES - Whilst you may not necessarily be charged for minor items you may be charge to damage to glass, polished surfaces or major items. TELEVISION is received via satellite. Whilst English channels are available we can make no guarantee of the channels you can watch. ELECTRICITY is normally included with the exception of winter and longer terms. SHOULD THERE BE ANY CAUSE FOR COMPLAINT, or accidental damage, this must be reported to the owner or agent immediately otherwise the matter cannot be fully investigated. IT IS TOO LATE TO REPORT AFTER THE HOLIDAY. and snacks on the sand and up to full bar/restaurant standard.